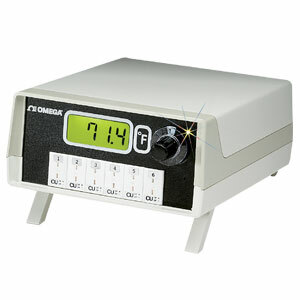 The DP5000A and BS6000 series of temperature panel and benchtop meters are both highly versatile and accurate. Available in thermocouple and infrared inputs, thermistor and RTD versions with 0.1 degree resolution, auto ranging to 1 degree above 1000°. The thermocouple versions are switch selectable for one of six thermocouple types from the rear panel. The DP5000A series is micro-processor driven and fully self-calibrating, offering exceptional accuracy and long term stability. The backlit LCD is easy to read in any light conditions from dim to bright sunlight, or fluorescent lighting. * Can be used with OS36-K-50 and OS36-K-440. Also will work with OS37 and OS38 units with either 20:1 or 100:1 fields of view. Comes complete with power cord, mating connector(s), operators’ manual.